It’s destructive (stops any YouTube playback), annoying (it will come back in a week or two even if you hit the “I don’t want to use my full name” button), and it’s creating clutter. 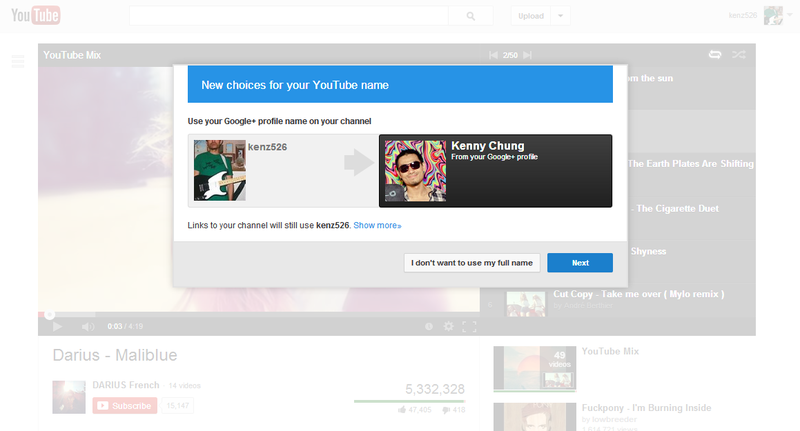 What I mean by this last point is that even if you don’t want to connect your YouTube account to your Google+ account, you can choose to keep your old username. Except, that actually creates a new Google+ account for that username. So then you’d end up with two Google+ accounts, one dedicated to YouTube. I understand that Google wants more of our data, and more activity on their social network. But this just rubs me the wrong way and seems to be an overly-insistent and heavy-handed vehicle for going about this.